For many, protecting the Arctic, is the defining environmental struggle of our time. All across the globe, people came together on April 20th to demonstrate their love for the Arctic and to tell international decision makers to take action to protect the frozen north. This is the story of how Greenpeace inspired 17,000 people to take action offline and why it worked so well. 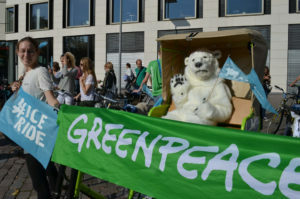 Globally we reached beyond the known and trusted network of active Greenpeace volunteers to other organisations and the diversity of people who have never taken action offline with Greenpeace before – but had perhaps signed an online petition. In fall 2012 the volunteer coordinator community of Greenpeace sparked the idea of a global day of action for the Save the Arctic campaign (www.savethearctic.org). The idea was not only to gather online signatures, the petition to declare a global sanctuary in the Arctic, but also to take the campaign out into the community. After the meeting in Paris with 20 volunteer coordinators; Markus one member of the core team recalls: “When we made our way home the next day, all of us were thinking about the idea of thousands of people coming together across the globe to show their love to the Arctic, to the planet and to the people.” To implement those goals they came up with, two main tools, human banners and speech bubble. Holding up a banner on the main street is not exciting anymore. 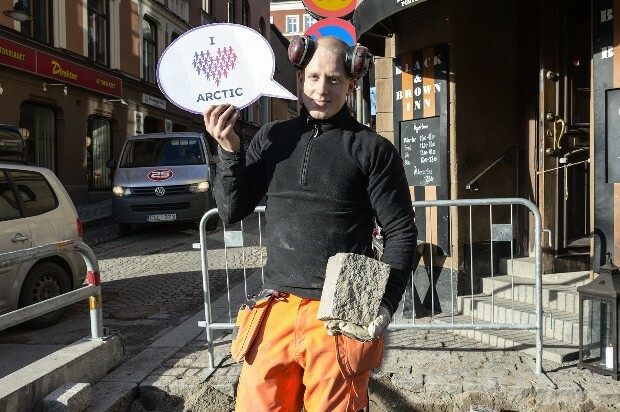 We needed new creative ways to demonstrate that a huge number of people care for the Arctic. Instead of holding a banner, we wanted people to ‘be‘ the banner. Starting with social media the idea started to spread, and as more Greenpeace offices and local groups got involved, the creative juices continued to flow. By inviting people to develop their own ideas and to share ideas online, Greenpeace US did a great job recruiting a wider community of people to get involved, and to join the global day of action. We wanted to make the idea as simple as possible so that everybody could join in. Toolkits on how to build a human banner were created centrally and spread widely, so that people who have no office around the corner, or local group in their city, could do it themselves. “When creating the ‘I Love Arctic’ toolkits, we tried to strike a good balance of providing helpful guidance, and leaving as much creative space as possible. This creative space allows local organisers to take on real ownership for the event, and it makes the events so much more colourful and diverse.” said Markus. A colourful outcome of this global day of action was the creation of a book with photographs and statements from all the countries involved in the event. The book was given to members of the Arctic council on the 15th of May in Kiruna, completing the circle from online mobilisations to offline, and creating a tangible campaign impact. Find out more about how this worked in a Greenpeace blog post. “It was inspiring to see all the images from all over the world. Especially the human banner from Jamaica where we don´t have an office.” said Markus. 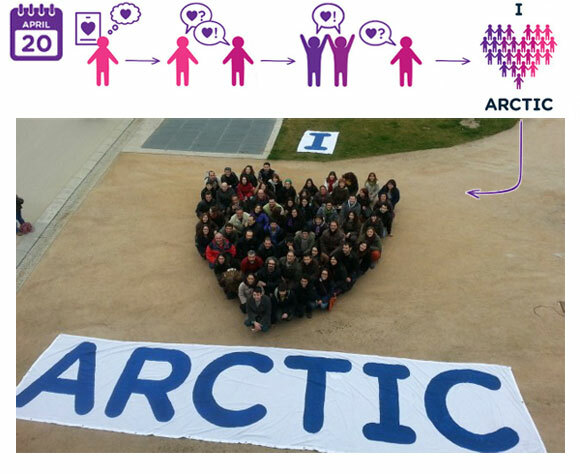 Political purpose: The Arctic Council narrative of the project gave the “I love Arctic” campaign the political purpose. All the questions and feedbacks around the Arctic Council showed that this political meeting gave a lot of motivation to take part in the “I love Arctic” day. Flexible toolkit: Not to give strict guidelines about how to build the human banner. To make a heart of 10 people on an iconic place can be just as effective as with 200 people. All the photographs show that it generated a great creativity by the volunteers. Early start of the planning process: Starting in October 2012 ( 7 months before the event) was a good timescale to anchor the global day of action in the year program of the offices and get in contact with the volunteers very early. 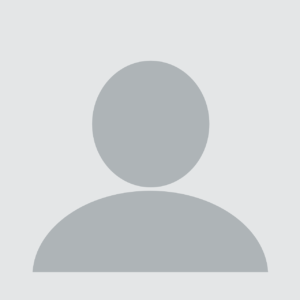 Co-creation within the project development: There have been regular meetings, bi-weekly core team calls and community calls made sure that everyone is on the same organization level. The communication within the team worked quite good, using Skype and conference calls. It was great experience for volunteers, coordinators as well as for the whole organization. An excellent lesson to be learned for our next campaigns and projects.